M.; Lacôte, E. Angew. Chem. Int. Ed. 2011, 50, 10294. 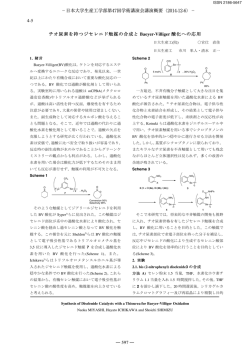 Miyaura, N.; Itoh, M.; Suzuki, A.; Brown, H. C.; Midland, M. M.; Jacob, P., III. J. Am. Chem. Soc. 1972, 94, 6549. Newcomb, M.; Kaplan, J. Tetrahedron Lett. 1987, 28, 1615. 先駆的な反応例：Shirakawa, E.; Itoh, K.; Higashino, T.; Hayashi, T. J. Am. Chem. Soc. 2010, 132, 15537. Atmospheric CO in the Presence of Tetrabutylammonium Borohydride. Kobayashi, S.; Kawamoto, T.; Uehara, S.; Fukuyama, T.; Ryu, I. Org. Lett. A.; Ryu, I. J. Org. Chem. 2011, 76, 7096. Hydroxymethylation. Kawamoto, T.; Okada, T.; Curran, D. P.; Ryu, I. Org. 1,3-Dimethylimidazol-2-ylidene Borane. Kawamoto, T.; Fukuyama, T.; Ryu, I.
J. Am. Chem. Soc. 2012, 134, 875. Kawamoto, T.; Ryu, I. Chimia 2012, 66, 372. Cyanoborohydride Promote the Biaryl Coupling of Iodoarenes and Benzene. Kawamoto, T.; Sato, A.; Ryu, I. in preparation. Medium. Fukuyama, T.; Kawamoto, T.; Okamura, T.; Denichoux, A.; Ryu, I. Flow Giese Reaction Using Cyanoborohydride as a Radical Mediator. Fukuyama, T.; Kawamoto, T.; Kobayashi, M.; Ryu, I. Beilstein J. Org. Chem.